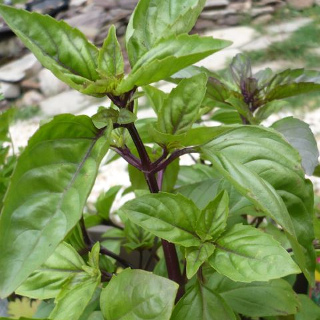 Cinnamon basil is a delicious cinnamon-scented herb with green leaves and purple stems and flowers. Useful in savory dishes as well as deserts. 9-11 weeks to harvest. 200 seeds per packet. Photo by Cliff (CC BY 2.0). Cinnamon is an open-pollinated variety of basil meaning you can save the seeds from it year after year and they'll grow true to type. The date and location where it was first bred are unknown. The leaves of Cinnamon basil contain the aromatic compound methyl cinnamate, the same substance is found in bark of the cinnamon tree and is responsible for its characteristic flavour. Cinnamon basil is a versatile herb in that can be used in place of both regular basil and cinnamon in dishes where both flavours won't clash. It makes a delicious pesto and is also great simply added whole to salads or chopped finely and used in a vinegar based dressing. It's also surprising delicious in desserts, it can replace ground cinnamon in pumpkin pies or be blended into batter, whipped cream or icing for use on cakes. The scent of Cinnamon basil helps to repel white-flies so plant them in your tomato patch to gain this benefit. Cinnamon basil prefers growing in a spot that receives full sun but it will also tolerate light shade. Ensure your garden soil is free draining, grow basil in raised beds if your soil is compacted or heavy with clay particles. Cinnamon basil can be a heavy feeder, so be sure to dig lots of organic fertiliser, compost, well-rotted manures or worm castings through your garden beds prior to sowing. Fertilise basil plants once a month with an organic liquid fertiliser, worm juice or a pelleted organic fertiliser. Cinnamon basil doesn't like to dry out so water regularly and mulch around plants well to retain moisture, keep their root systems cool and reduce competition from weeds. Pinch out shoot tips to encourage your basil plants to produce more side shoots and become bushier. Basil plants won't produce leaves once they begin to flower so pick off any flowering shoots as they form to extend the harvest period of your plants. This variety may be grown as a perennial in warmer climates, cut back hard at the end of the growing season. In cooler and temperate regions of Australia sow Cinnamon basil seeds from September to December. In subtropical regions of Australia sow Cinnamon basil seeds from August to December. In tropical regions of Australia you can sow Cinnamon basil seeds successfully any time of the year. Sow Cinnamon basil seeds 6mm deep, spacing or thinning plants to about 20cm apart to allow them room to grow. Cinnamon basil seeds take between 7 and 10 days to germinate once sown. Cinnamon basil will produce a decent harvest of leaves 9 to 11 weeks after sowing the seeds, although shoot tips and individual leaves may be picked before then as needed.